Even though it may be out of season I'd like to tell you about a man who had a very different kind of Christmas party for some very special friends of his. No doubt many of you have heard about him before. He was known as the friend of the beaver in Canada because he had been able to tame them and helped to save them from extinction. His name was Grey Owl. Everyone thought he was a real Apache Indian who had come from the United States to live in Canada but actually he was an Englishman whose real name was Archie Belaney. When he was a boy in England he learned to love all animals. He kept all sorts of pets around his home, and became very interested in stories about hunting and trapping in Canada. When he was about nineteen, he came to this country and headed for northern Ontario where he got a job as a canoeman on a hunting expedition. 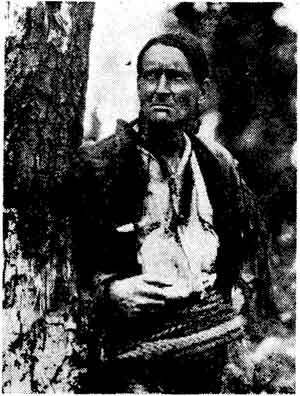 He didn't know much about such work but an Ojibwa Indian called Michelle taught him how to handle a canoe, to hunt, and how to keep from getting lost in the woods. After a few years on hunting expeditions, he began to dress like an Indian. In fact he preferred the company of Indians. He learned their language and for a number of years lived with an Ojibwa tribe. All this time he never spoke English. White men who met him believed he was an Indian and he never denied it. The Ojibwas and especially a chief named Neganikabu, showed him all the water routes in the north country, taught him all the secrets of the forest, how to hunt a moose, how to live in the forest, and how to read the signs of Indian trails. Soon he was adopted by the tribe in a camp-fire ceremony and became known as Wa-sha-quon-asin which means Shining Beak, Grey Owl. One day he caught two young beaver whom he called McGinnis and McGinty. From then on it was the beaver that he loved most of all animals. He started writing stories about animals and especially about McGinnis and McGinty and about another two of his friends  Jelly Roll and Rawhide. One of the stories Grey Owl liked to tell was about a Christmas party Grey Owl had for McGinnis and McGinty, the first two beaver he had trained. McGinnis and McGinty lived in a river near his cabin. When they found out that Grey Owl wouldn't harm them they became very friendly. They would come right up to his cabin and then inside to get food. One Christmas day Grey Owl took a little Christmas tree and stuck it in a crack in the cabin floor. Then he hung bits of candy and apple on strings from the branches. McGinnis and McGinty came right up to the tree, chewed the strings and got the candy and apple. So Grey Owl put some more on the tree. When they finished this the two young beaver knocked the tree over and carried it away to their home in the river bank. But Grey Owl didn't mind that, because after all, I suppose, the best present you could give a beaver at Christmas would be a tree.